Welcome to Scandinavia with Intiamatkat!!! After morning breakfast proceed to city orientation tour which includes Senate square, Rock Church ( Included ), Olympic Stadium, Sibelius Monument etc. Later proceed to train station for overnight train to Rovaniemi. Today your destination to Rovaniemi. The Capital of Lapland-Finland. Get ready in train itself on arrival get transfer to visit Town Hall, Cathedral, Arktikum museum etc.. till Lunch. At Noon check in at the hotel and relax for sometime. After that proceed to Santa park. We can spend a full evening in Santa Park. Santa Park fun continues. The evening is reserved for 'The Big Man' again with a trip to make a treasure full of memories and pictures. It includes Santa’s office trip, Elves Post Office trip, Toy Workshop Shopping Area, Elf School, Elf School Certificate, Santa Hat, Santa Park dance show, Train story, Bob the barn and Calligraphy School and so on.. The list is endless and possibilities are countless. Later transfer to Hotel and relaxed. Today at morning, we will proceed to see Ranua zoo. The place is in the Arctic and into Lapland, it’s a wildlife center of Lapland. You may see here some winter wild animals if you are lucky. Later will do Husky dog sledding. Then will come back to Rovaniemi. 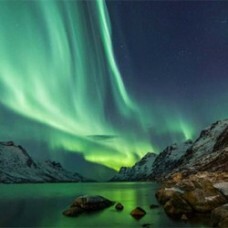 In Midnight will go for Northern lights hunting. After breakfast proceed to Tromso on the way visit beautiful villages, Fjord’s, Lakes, Mountains with picturesque views. We will have visit to snow village Yllas then proceed. On arrival check-in & relax. Here also have possibilities to see Northern lights. In the morning, after breakfast proceed to visit panoramic tour of city which include Polar Museum, Polaria, Cable car ride for amazing view of city Etc. In evening proceed for Northern lights Hunting. After breakfast proceed to airport catch flight for Oslo early morning. On arrival visit panoramic city tour of Oslo in which you will visit Holmenkollen ( Included ), Vigeland Sculpture, Oslo fjord. Later hotel check-in & relax. Oslo, the capital of Norway sits on the country’s southern coasts in the head of the Oslofjord and is known for its city wide green spaces and museums. After breakfast proceed to airport. Board a flight back to Hometown with sweet memories from Scandinavia, Intiamatkat and let us meet again on one more memorable holidays. Accommodation on twin sharing basis for hotels for the duration of the tour in 3 star hotels. Single supplement will be charged separately. In cottages, cruises and camping sites, it will be group accommodation and group sharing. Sightseeing entrance as per Itinerary. Meals Breakfast, Lunch and Dinner as mentioned in the itinerary only. Coach transfers as per the itinerary. Pre-departure orientation and travel expert advice. Entrance to sightseeing’s other than mentioned in the itinerary - can be availed at additional cost. Travel insurance & Visa assistance above the age 56 years ( needs to be paid at actual ). Cost of your round trip Air / Rail / Cruise ticket which enables you to join the tour. For coats/Jackets to visit snow point or any special attire required to visit any particular sightseeing place. Any up gradation in the room category or airline class. Any soft drink / hard drink, Desserts, beverages. Any extra expenses incurred for changing the route due to any unforeseen circumstances, forced instances, natural calamities, political disturbances, strikes etc. Tour manager has every right to make necessary and required changes in ongoing tour. He will update the guest at that moment.